LANSING—State Sen. Ken Horn, R-Frankenmuth, welcomed U.S. Rep. John Moolenaar to the Frankenmuth Morning Rotary Club’s weekly breakfast meeting on Wednesday. 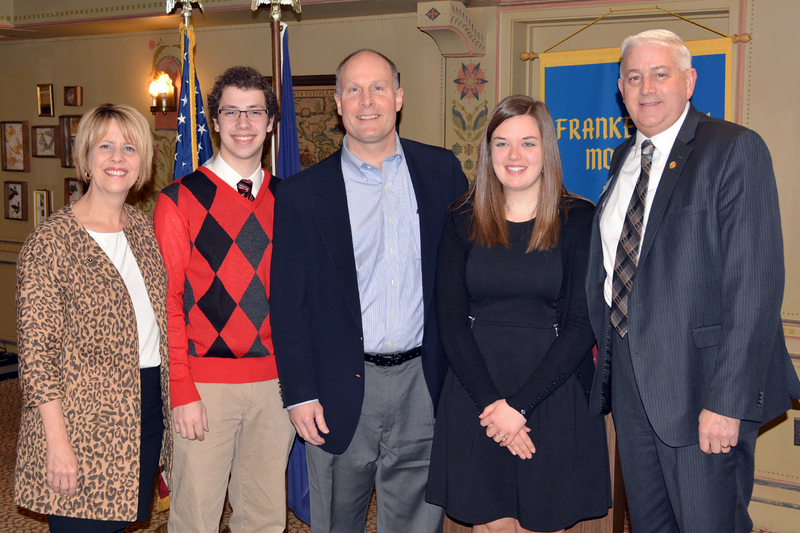 Horn was joined by Congressman Moolenaar and Superintendent of Frankenmuth Schools, Mary Anne Ackerman, to present the “Frankenmuth Morning Rotary Club Youth Volunteers of the Year” award to this year’s winners: Mark Sylvester and Abigail Vaughn of Frankenmuth High School. The Frankenmuth Morning Rotary Club meets every Wednesday at Zehnders of Frankenmuth for breakfast at 6:45 a.m., and meetings begin at 7 a.m. Please visit www.fmrotary.com for more information. A print-quality photograph is available by clicking on the image or by visiting the senator’s website at: www.SenatorKenHorn.com. Click on “Photowire” under the Media Center tab. Photo Caption: State Sen. Ken Horn, R-Frankenmuth, (right) U.S. Rep. John Moolenaar (center) and Frankenmuth Schools Superintendent Mary Anne Ackerman (left) presented the “Frankenmuth Morning Rotary Club Youth Volunteers of the Year” award at the club’s weekly breakfast meeting to this year’s winners: Mark Sylvester and Abigail Vaughn of Frankenmuth High School. Photo Courtesy of Karen Zehnder at Rummel Studios.